Will Kwan has spent a lot of time in the Don River Valley Park watching it evolve. 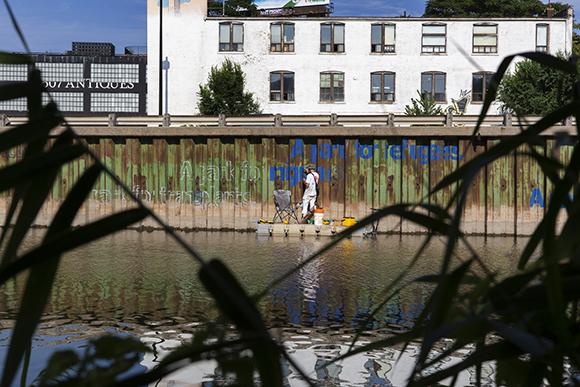 “Because my studio overlooked the southern stretch of the Don River between Dundas and Queen Street East, I was seeing a microcosm of the city in the park.” says the Toronto-based artist. The first thing he would notice were the morning commuters flying by on their bikes. A couple hours later, people would begin their runs or take their dogs for a walk. The environment could change on a daily basis. Over the years, Kwan watched new developments pop up and neighbourhoods grow. 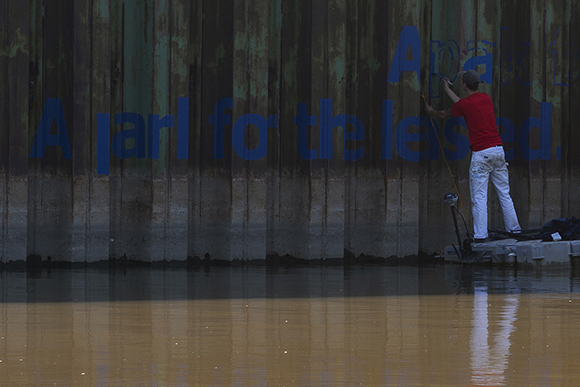 It’s this change that led Kwan to create A Park For All; this text installation painted on the retaining wall along the Lower Don River is the newest project in the Don River Valley Park Art Program. Spanning a half-kilometre along the east side of the Lower Don River, half of the artwork runs from Riverdale Park to Gerrard Street and the rest from Dundas Street to Queen Street East. Many of Kwan’s past works involved prolonged research about a place, a site, a city, an institution or a system. For this site-specific public installation, Kwan spent a lot of time observing the park. “Sometimes the projects that I do involve intensive research to drill down into a subject. In this case, I felt because there were so many layers to the park, so many different users and different views on what the creation of this park would mean, rather than depth, I was thought the solution was breadth, to open up to broad range of perspectives,” Kwan says. The history of the Don River Valley includes diverse uses and users; including Indigenous histories, industrial histories and cultural histories. It’s an urban park next to a highway and includes a rail corridor; it’s a park that borders many different and distinct neighbourhoods and has had many recreational uses. Part of the Don River flows with its natural topography and part of it has been straightened. Over the years, the Valley has seen rampant pollution and a recent focus on ecological revitalization. “I think that complexity is a huge part of the Don River lands. I wanted to deal with those things rather than try to isolate one thing and set it aside as something unique. I wanted to embrace everything,” Kwan says. His work responds to the city, the environment, different neighbourhoods and different lifestyles. This complication is spelled out as you follow the retaining wall and take in Kwan’s text. It oscillates as you read, seeming, in turn, funny, sweet and impossible; at once highly critical of gentrification and speaking the language of idealistic visions for cities. Kwan is interested in how we describe people. Not just in the traditional identities, but also in categories that come up for marketing purposes or in trying to define certain populations to determine their consumption behaviours. Identifiers drawn from pop culture and key words that are part of the moment. Even identities with multiple meanings like ‘herbivores,’ ‘carnivores,’ and ‘omnivores’ that refers to all the life in the park. A Park For All will be displayed for five years with its text visible in different ways depending on the season — partially hidden during peak foliage, with more revealed during the winter months. To coincide with the launch of this installation, Evergreen presents a new Don Dialogue: In Conversation with Artists Will Kwan, Gareth Long and Beth Stuart on September 25, 2018 at Evergreen Brick Works. The discussion will delve into the artists’ work, explore new models for public art, and the ways in which temporary public art can reflect the changing cityscape and pose critical questions about land, our use of and engagement with public space, and the histories and narratives of place. The event is free and registration is required.